One of the biggest and most powerful Bakugan yet, the Maxus Dragonoid will have your Bakugan opponents quaking in fear. It includes one Bakugan warrior (named Neo Dragonoid) and six Bakugan Trap (Grakas Hound, Dark Hound, Grafias, Brachium, Spitarm and SpyderFencer.) that, when transformed, can be assembled into a giant dragon robot. These seven pieces are unique and can't be found anywhere else, making this set essential for any Bakugan player/collector. 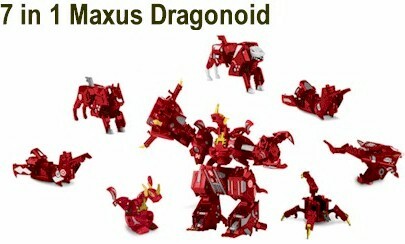 Purchase Maxus Dragonoid from Amazon now!